We splurged today – we had brunch at a hotel by the river with friends of ours. All stop signs pulled our = fabulous time had by the river. The hotel makes quite spectacle of the brunch. Guests start out at the top of the building with a few appetizers and a selection of fresh juices. All the while the guests enjoy a good conversation and the spectacular view from above. 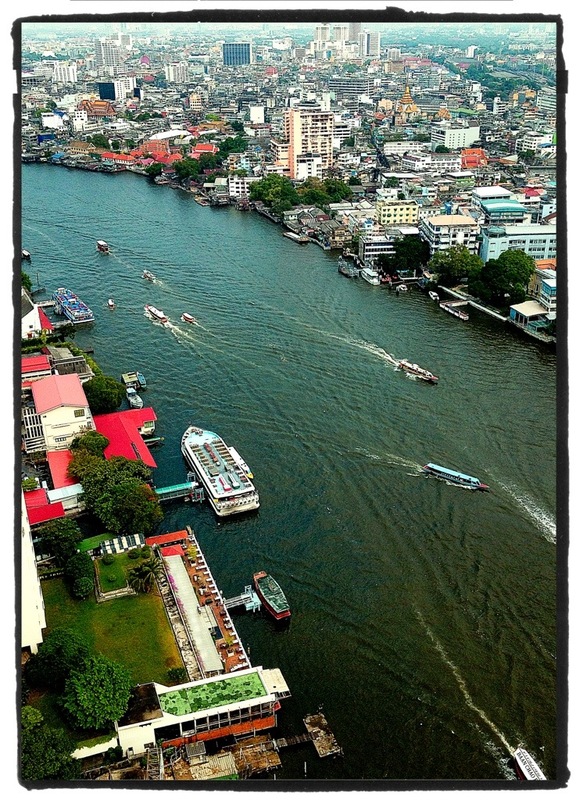 The view to the West overlooking the Chao Phraya river. Followed by the view to the East. 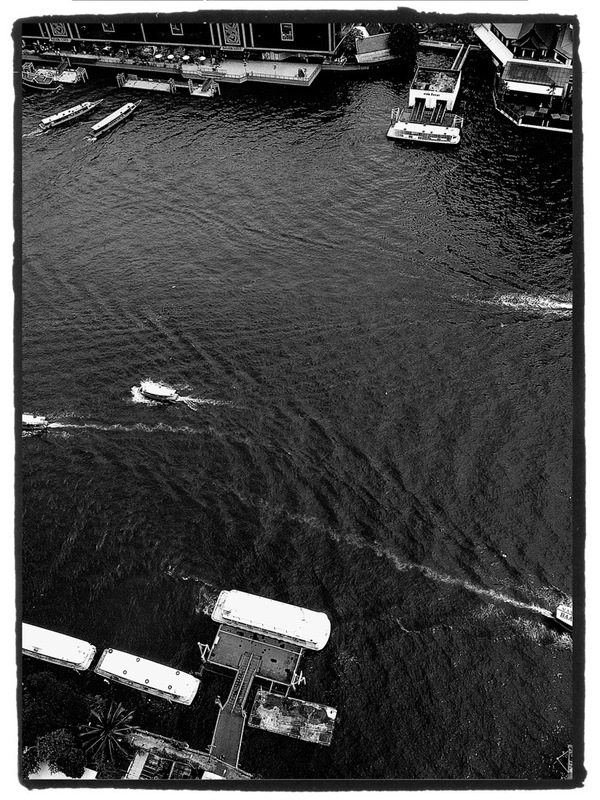 And straight down, where boats of all sizes leave white wakes in the river. Of course there had to more than fruit juices and appetizers. To enjoy that More we were asked to join the buffet at river level – otherwise known as the first floor. I will spare you the description of our culinary extravaganza – it was outstanding, we ate, drank and chatted for 4 1/2 great hours – instead I will show you a really big tree I found on the hotel premises. 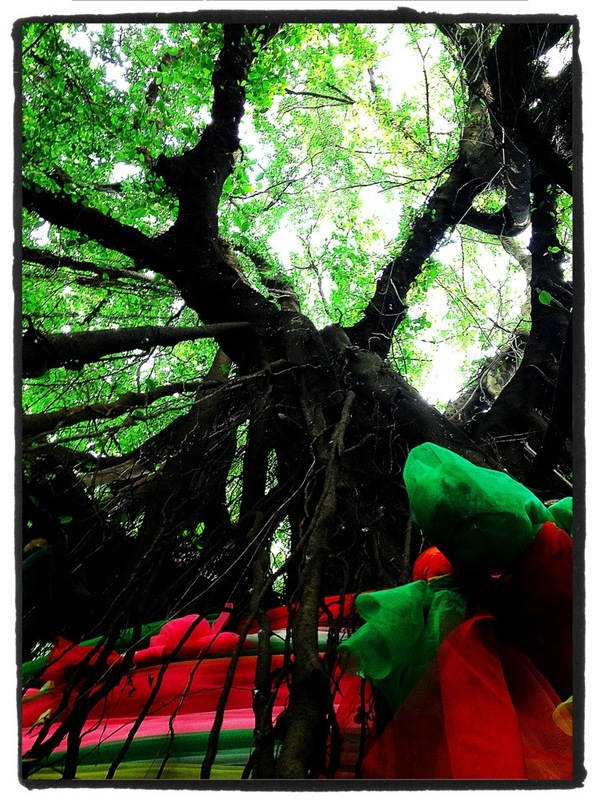 A Bunyan Tree. A tree of that size generates a lot if shade, but also radiates a lot of serenity and protection. Very peaceful. 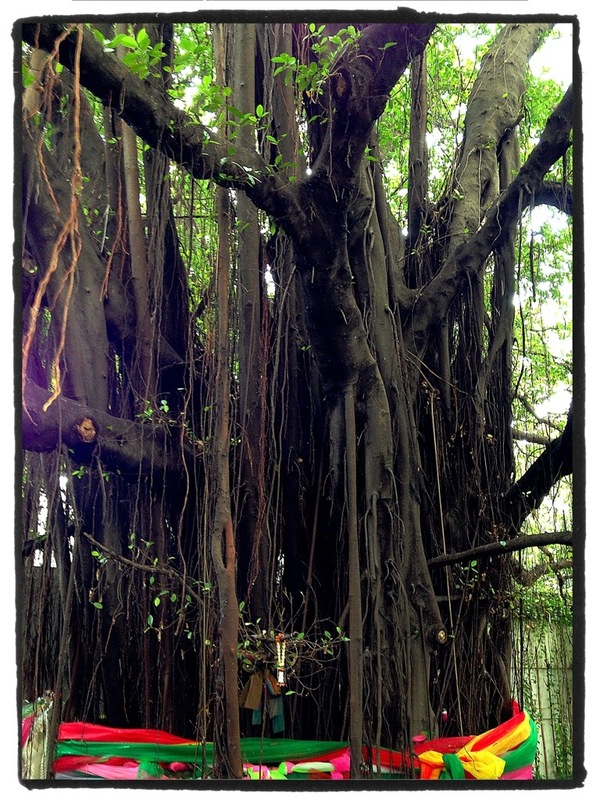 Bunyan trees have this otherworldly quality with their hanging vines and multitude of small stem that make up the main trunk. 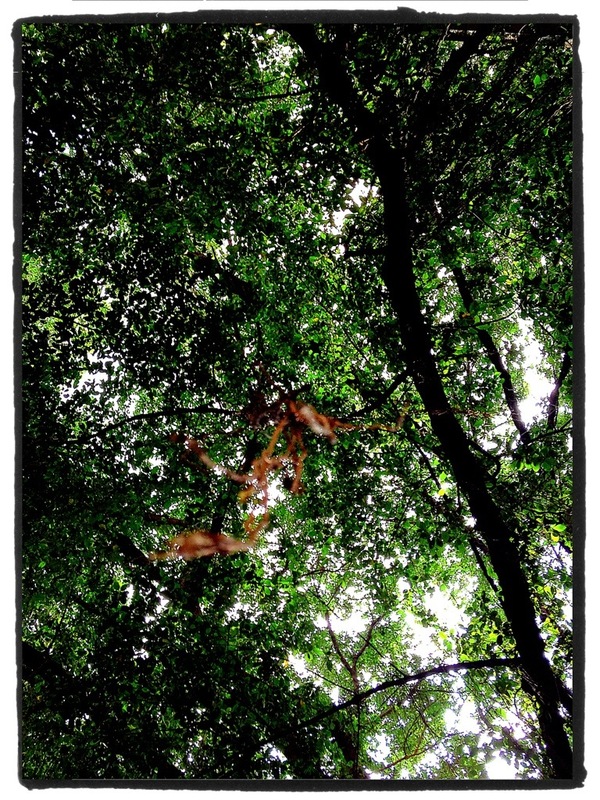 The last image for today was taken directly underneath one such hanging vine. And with that, stay sharp and remember splurging is that much more satisfying when it is shared with others. 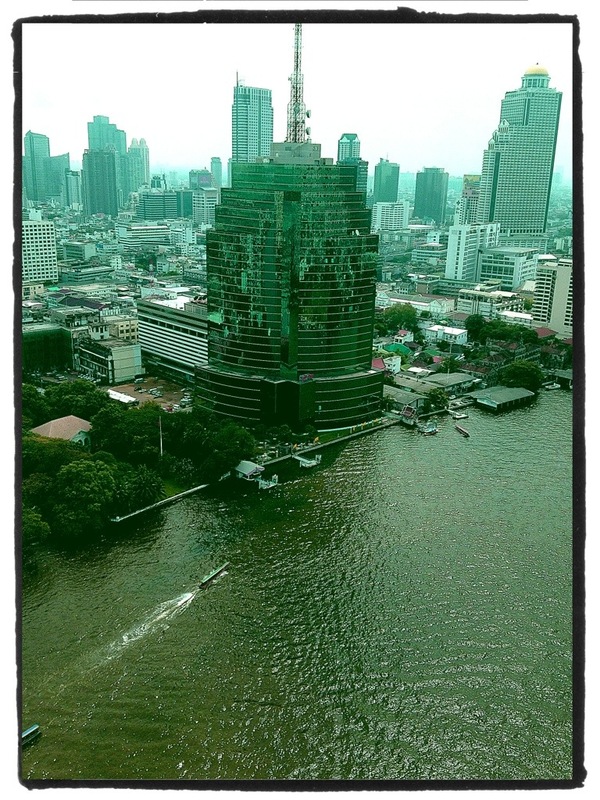 If we imagine Bangkok as an organism, its cardio vascular system would be of great concern to us. The city smokes like crazy, the city boozes that Guns N Roses in their haydays look like choirboys, the city smells…well it just does and there seems to be more debauchery than in a Mötley Crüe video. And as you get older this lifestyle catches up with you and the doctor tells you about heart attacks and strokes if you don’t change your self-indulgent ways. 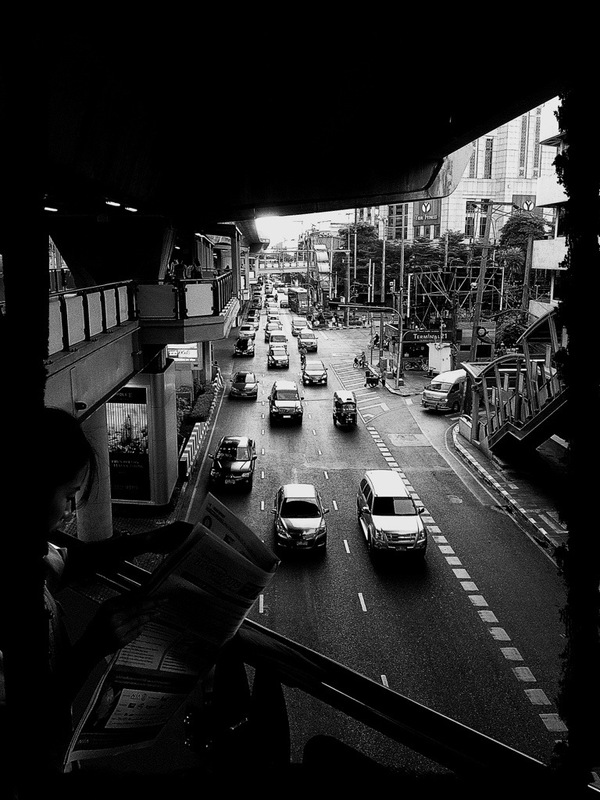 That would be if Bangkok were a proper organism, but it’s a city made of steel, concrete, tar and a variety of actual living organisms. 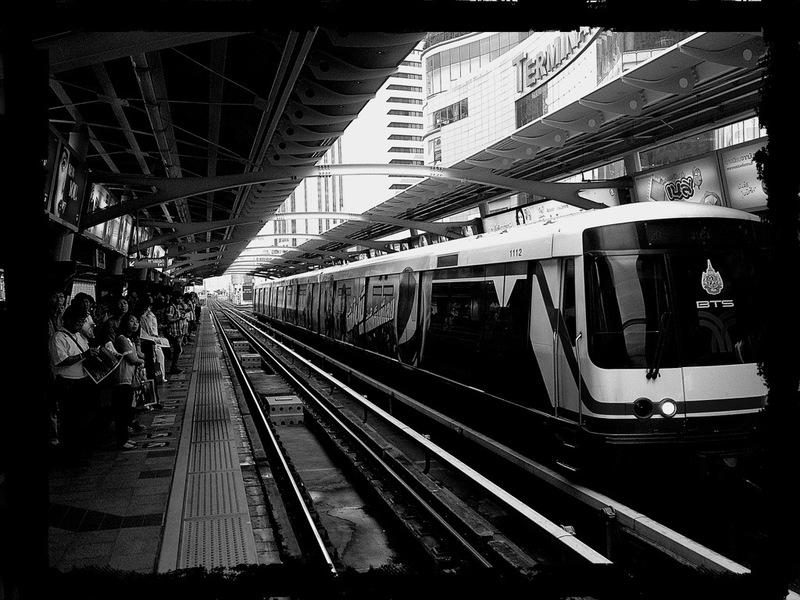 And thus, while Bangkok’s cardio vascular traffic system is that of a stroke and heart attack patient, it can smile its rotten-teeth smile at the doctors and point out that it’s got two perfectly working jugulars – the MRT and the BTS public rail transport systems that keep it alive and sustain the life style. And the doctor just stres because this changes everything.Yes these two arteries may suffer from high blood pressure because the trains are constantly overfilled, but at least if you squeeze in you reach you destination in a reasonable time reliably. The main organs are taken care of, but the extremities may be dying off – medically speaking. 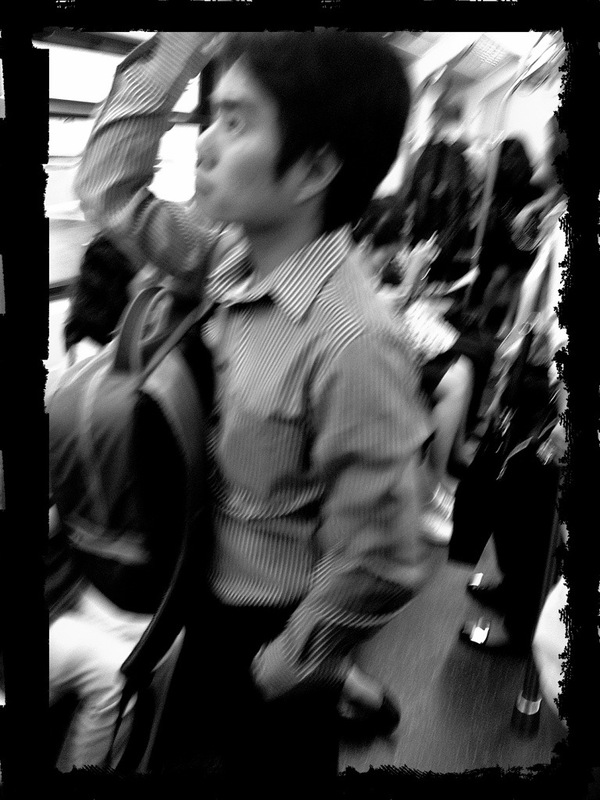 A look towards the eastern extremities of Bangkok. On the left, fresh red and white blood cells waiting to work in the guts on the city. On the right a heart beat about to transport blood away from the well taken care of body core. With that stay sharp and take care of your body it’s the only one you have and you don’t have a BTS or MRT. We are having a little celebration today and I set the breakfast table to start the festivities. 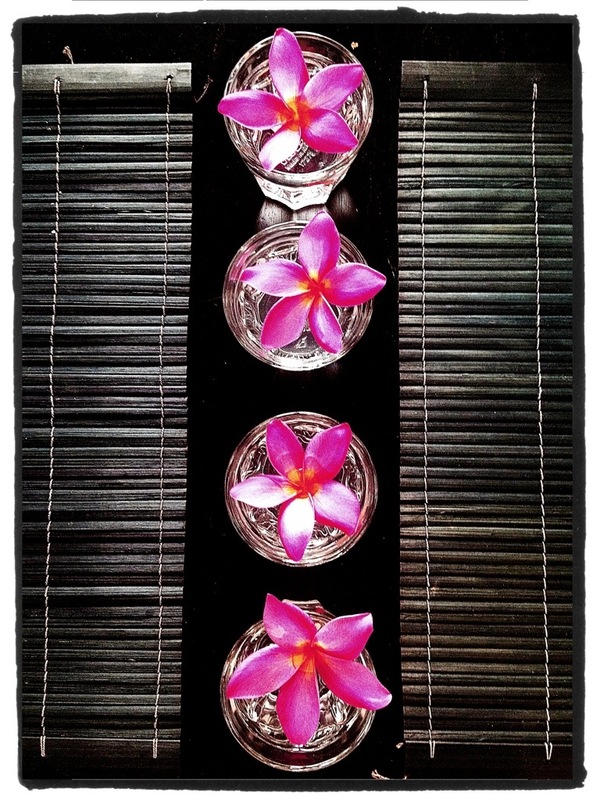 As I was half way through setting, the simplicity of the scene inspired me to take a quick still life. Just a short one. There are two sides to everything. Trust me – I mean it. 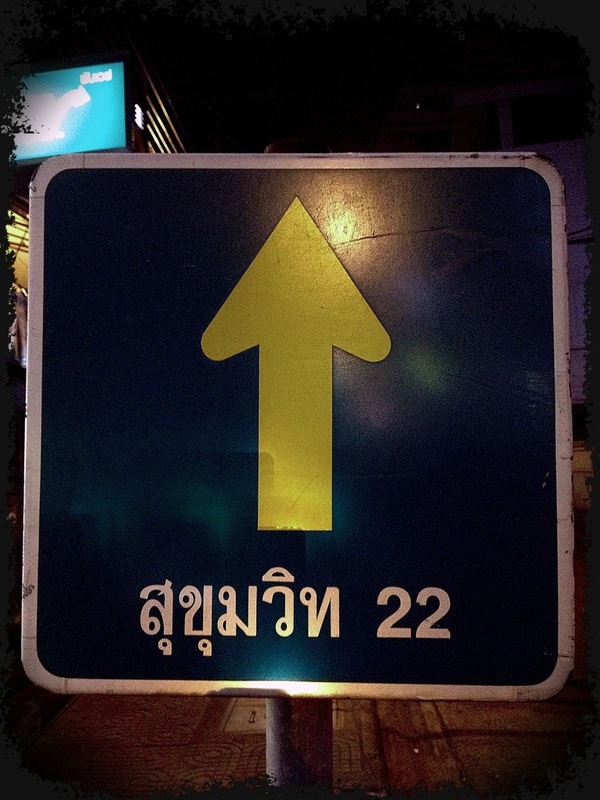 Like this sign that indicates that a little further ahead something involving a 22 will happen maybe you turn 22 again or already. Or you may get shot with a 22. 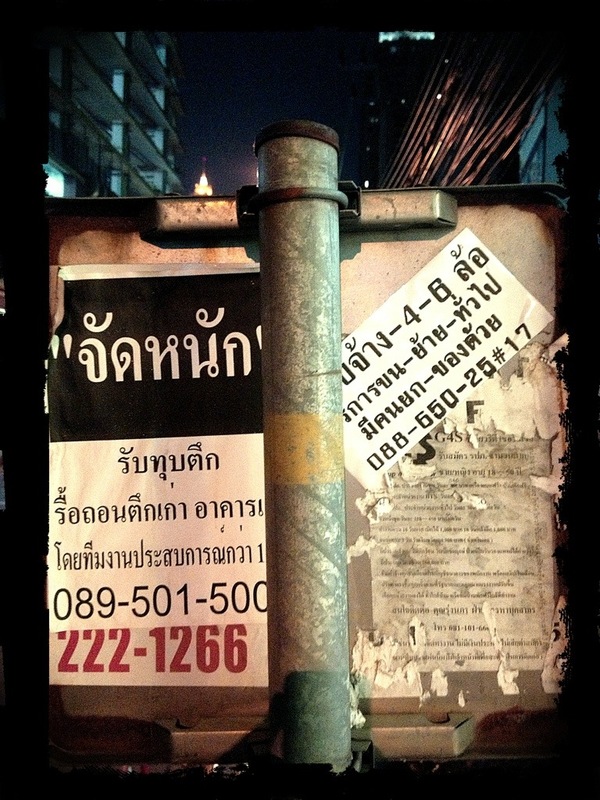 Or maybe you will get to Soi 22 if you follow this road. I don’t know, I just take the images. But I can tell you this, there is an entirely different side to this story that breaks this case wide open. Coincidence? – I think not. Vigilance, constant vigilance and stay sharp! 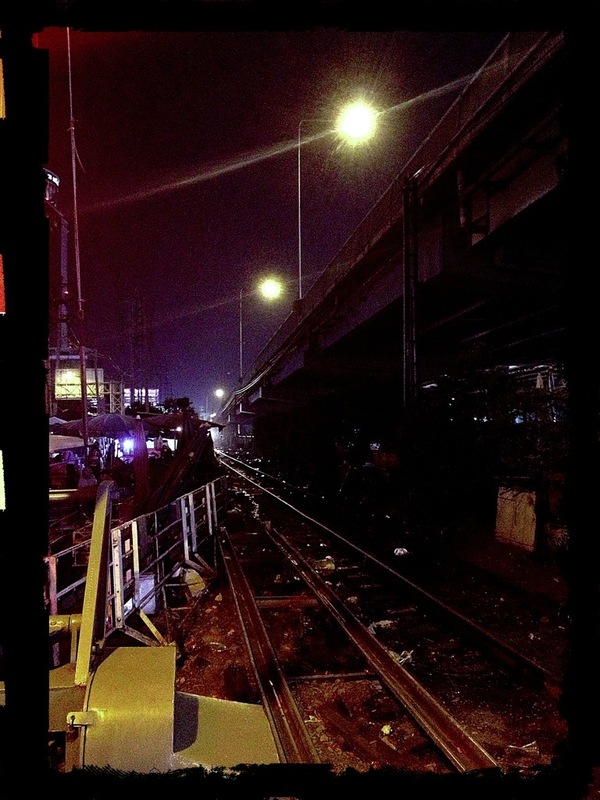 A little Bangkok nightlife report from the street. 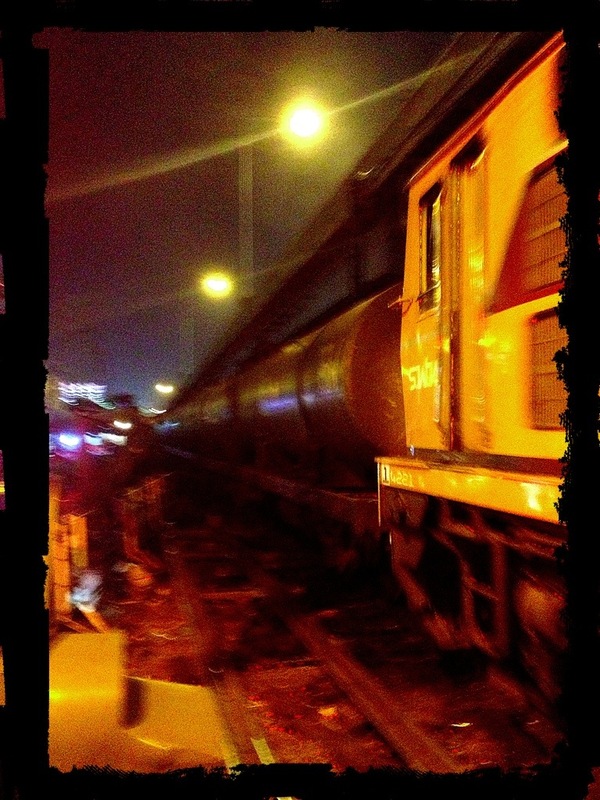 A train rolled right across Sukhumvit right at rush hour – ah the mayhem. Traffic that was not moving much slowed down to not moving at all. But fear not a man with a whistle, the training and nerves to use it (said whistle) was on hand. Thais love a dude in an ill fitting uniform and to further accentuate the authority he must be equipped with a whistle. The whistle requires a grueling twelve week training program where the future law enforcers learn the fine art of blowing a whistle really loud and in short angry bursts. But that’s only important on the periphery of today’s topic, which was the train. You see the rails, but no train, yet in an unusual display of foresight the road was blocked very early, like a minute and a half before the train barreled through at a casual pace. If the train could walk, it would have swaggered. 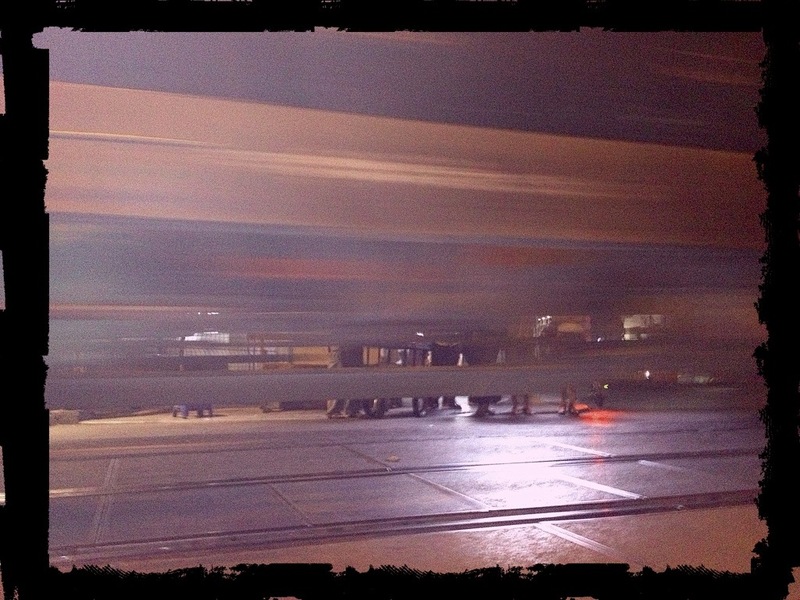 …and here come the carriages. Now for the action shots. 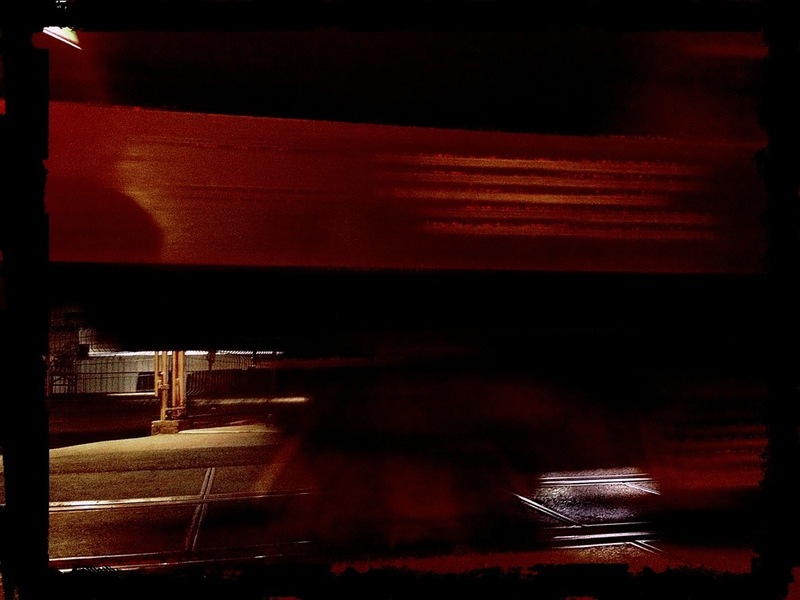 Get ready for the crazy juxtaposition of standstill and dynamic motion…ah correctemundo the eternal tension. And one more because it was so much fun. Finally, the man with the whistle – a Sr Principal Whistle Operator, as I was assured from a reliable source – opened the road for a continuation of jammed traffic again. 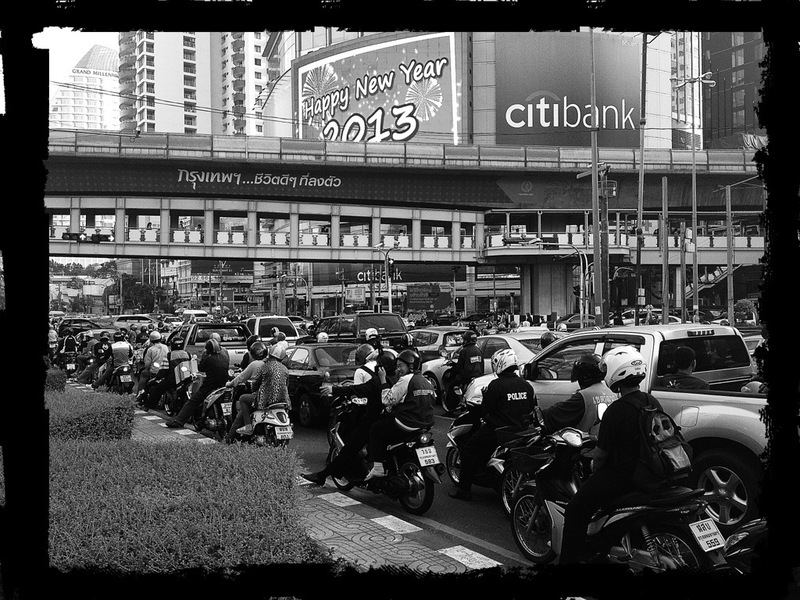 I will leave you with the knowledge and the comfort that Sukhumvit stays a perpetual traffic jam. 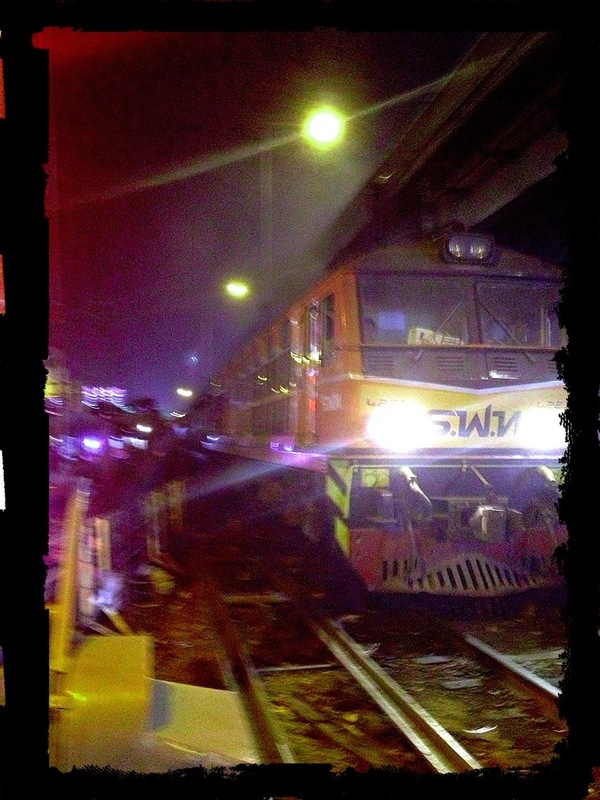 Stay sharp and next time traffic gets a bit viscous, remember Sukhumvit when the train cometh across. 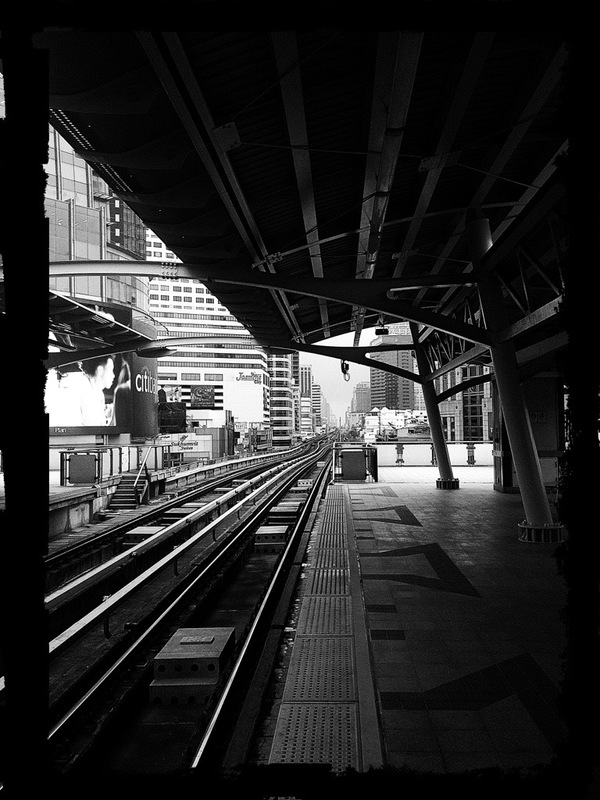 I went through the images I took in Hong Kong a month ago and a found a few that inspired me to work with. Interestingly, they all contain tiles. But I think that is just a coincidence. What really attracted me to them is their geometric setup. There is either depth or very strict geometry – straight lines, different vanishing points. And on top of it, there is usually a little colour dot like a cherry on whipped cream. This is the delivery entrance of the Hong Kong Museum Of Contemporary Art. A plain white tile building on the outside with an architecture that comes across as a white canvas. Very straight forward. The few design elements repeat themselves and that repetition is emphasized by using tiles for the facade. 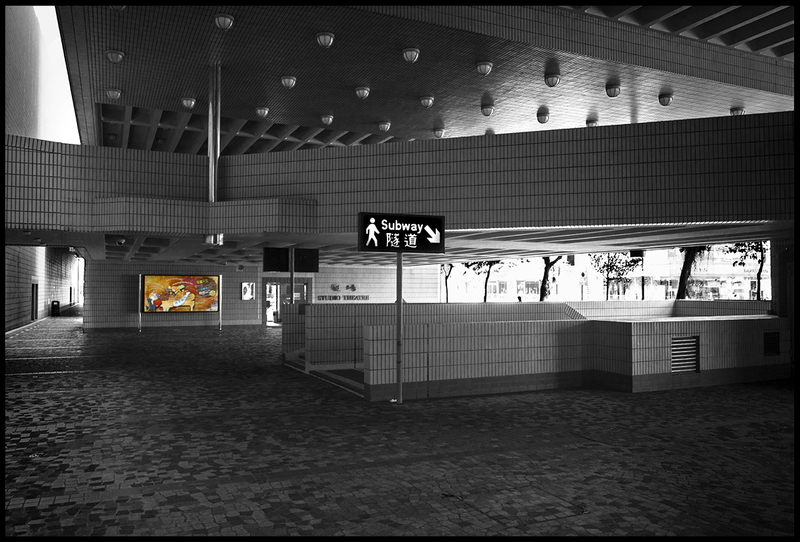 Then there is this ground level are, that allows MOCA visitors to wander around to get down town Tsim Sha Tsui or to eat or drink a bit at one of the restaurants and cafes. Again, the rectangular tiles bring order, the columns bring a sense of depth while the people bring life in this rather sterile appearance. 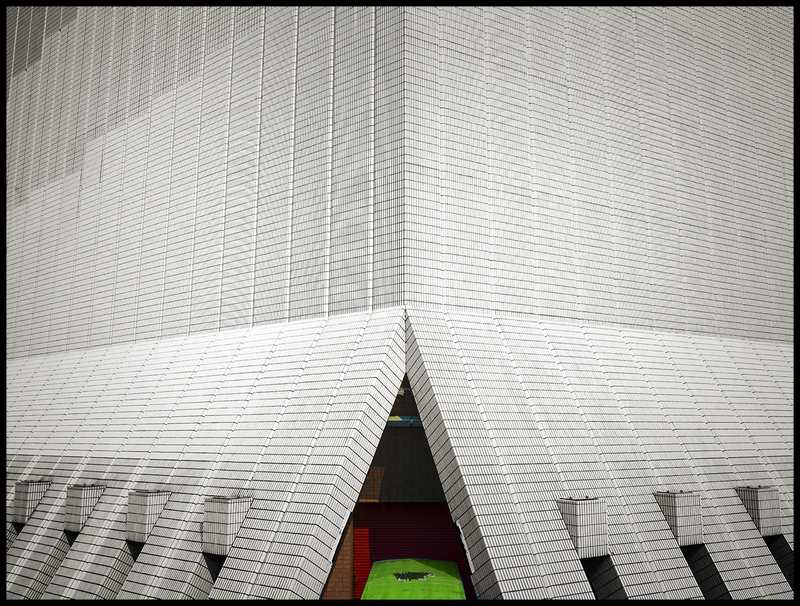 Again, tiles bring a sense of order on a micro level, but the architecture brings sectioning at a macro level. 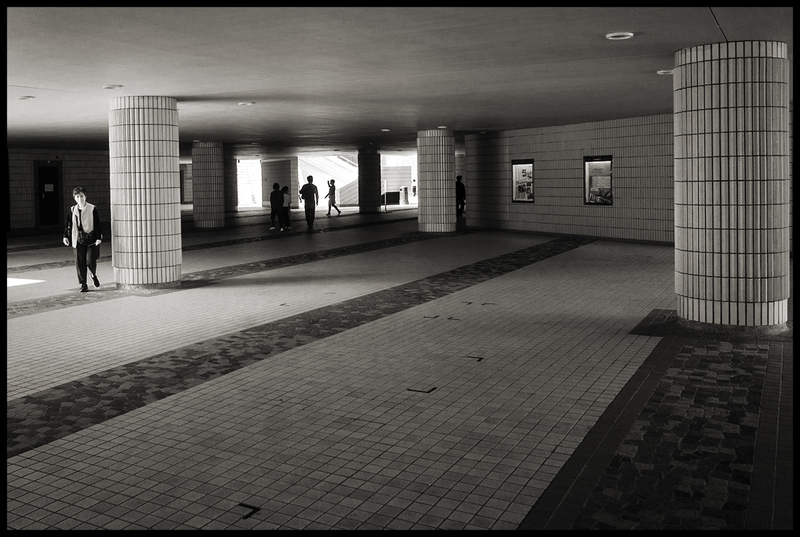 Finally, an under-path that veers off to the left into infinity with ads for the MOCA. 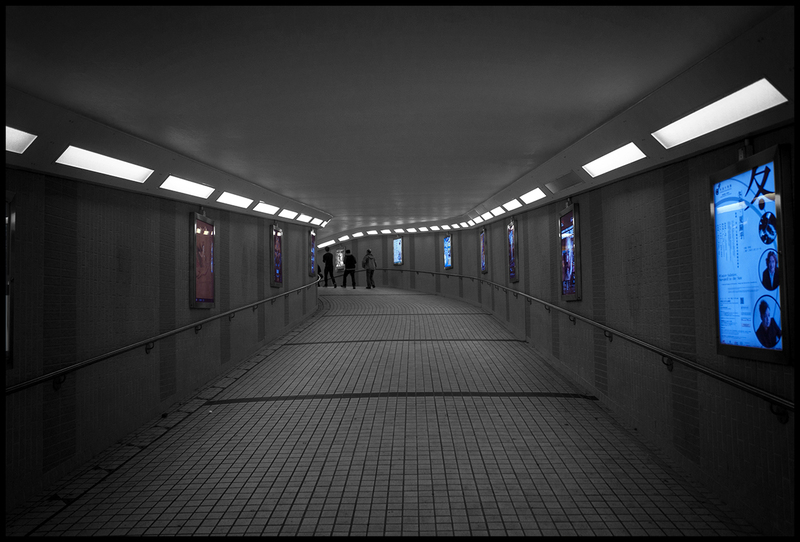 The order from the tiles is further supported with the lights champfering the tunnel. While the curvature of the under-path is further accentuated by the hand rails. So much for our little architectural walk through Hong Kong. Have a good Thursday and stay sharp. While in the US the discussion rages about people right to bear arms, I -despite the impression that some have – go to work everyday…without a gun or an assault rifle or an Apache Attack Helicopter, not even a slingshot. However today, it’s not about weapons, but a documentation of my way to work. 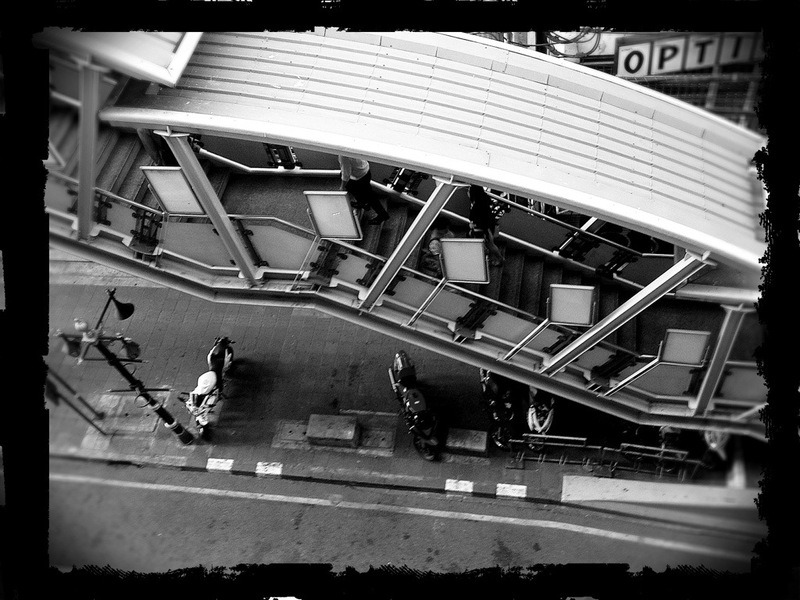 I walk the first 50 meters to the motorcycle taxi stand. 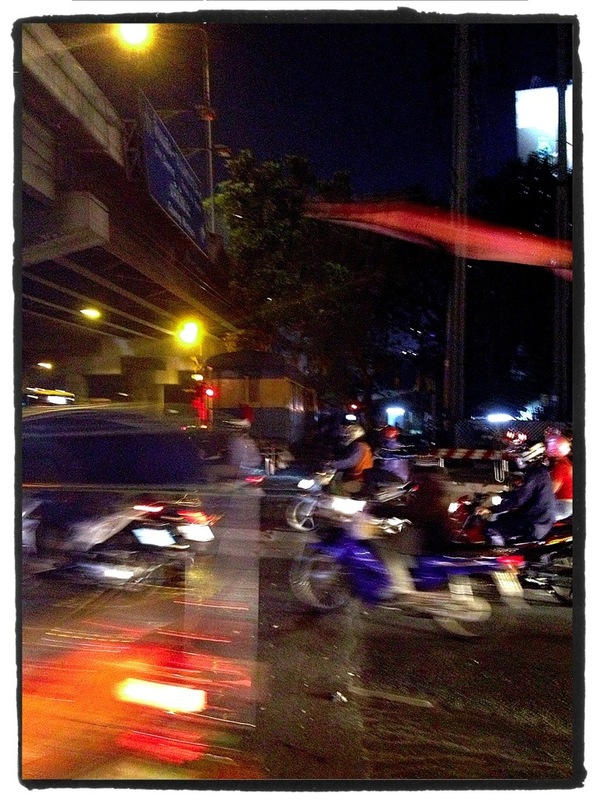 Then via motorcycle taxi to the BTS where traffic is already “jamming”. Up the forty-two steps to the BTS. Where I line up to swipe my pass. I have written about my frustration of the allocation of entry vs exit gates. It’s still a sore point, but I honestly can’t change it. And the BTS company has started to use four carriage trains, although three months late but it’s a huge improvement, because you can get on the train during rush hours. On the train it’s most people fr themselves. 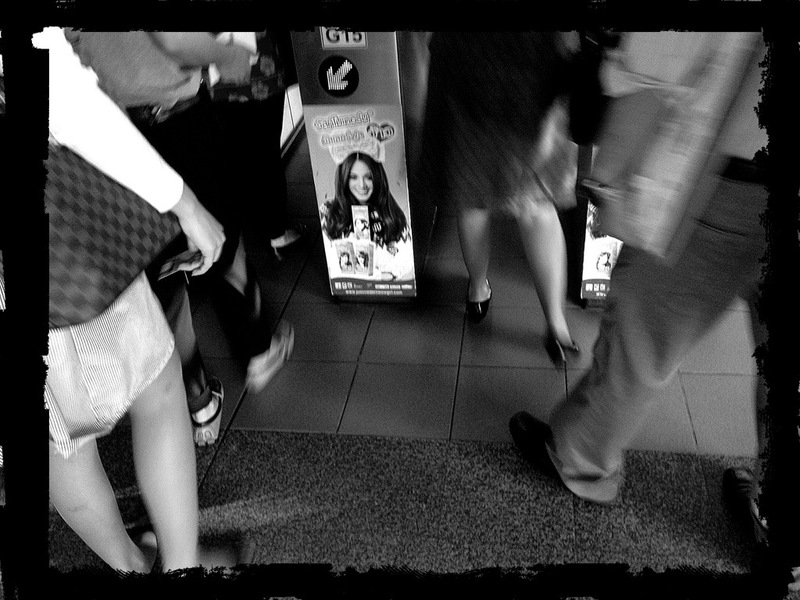 A few are talking to each other, some watch the LCD displays that are blaring commercials, but most just stare. 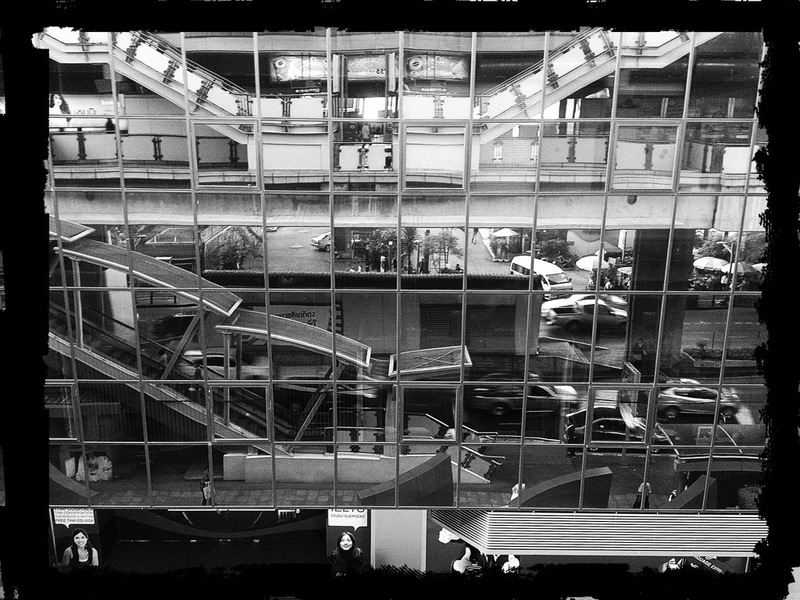 Upon arrival, my eye catches the reflection in a building facade of all this traffic, all these people eagerly heading to their offices to become Titans Of Industry. But there are other people, too. 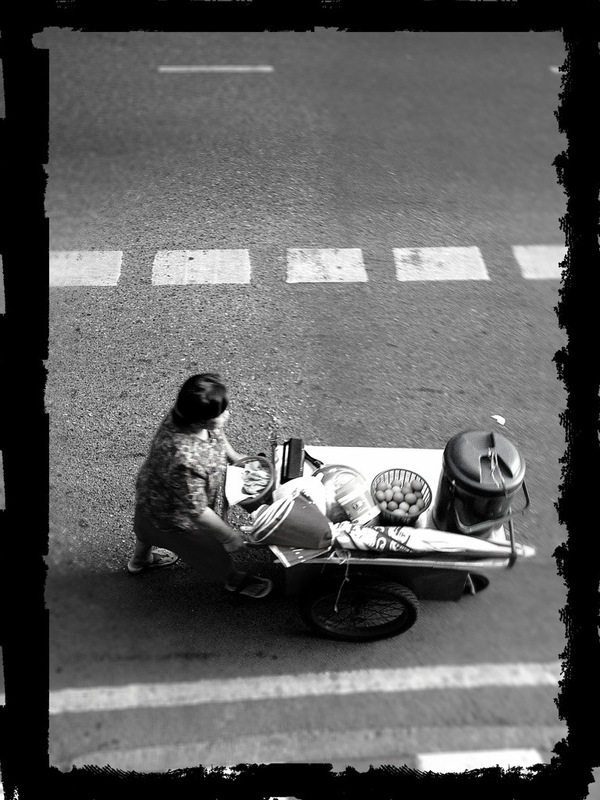 Like this mobile restaurant being pushed down Sukhumvit this morning.